At Both Ends: What's Your Purple Goldfish? This week I had the opportunity to travel to a conference and listen to featured speaker Stan Phelps. Mr. Phelps recently published a book, What's Your Purple Goldfish? I'm not going to give away the secret of what a purple goldfish is, but I will share with you the gist of his message. The subtitle of the book is How to Win Customers & Influence Word of Mouth. Mr. Phelps began on a journey to find 1,001 examples of marketing lagniappe. What's lagniappe? Pronounced lan-yap, it's a Creole term for "a little something extra." This book is the result of his findings of examples of companies who deliver excellent customer services by giving "a little something extra" to their customers. Bigelow Tea - A recent customer ordered a box of Bigelow Vanilla Chai Tea, and the first item that fell out was a packet of Constant Comment. The customer feared he had received the wrong order. Instead, it turned out to be a complimentary sample, and the customer was delighted to have a fun new item to try. Plaza Cleaners - This Portland, Oregon company posts a sign on their door, "If you are unemployed an need an outfit clean for an interview, we will clean it for free." They're paying it forward; maybe, just maybe, the local economy will improve a bit if that person gets the job. Nurse Next Door - We all make mistakes, as much as we strive for business and personal perfection. If this home health service provider makes a mistake, they deliver a fresh baked apple "humble pie" as an apology for the poor customer service. Southwest Airlines - Ok, we've all seen this one, but who doesn't love the "bags fly free" marketing message? Nordstrom - This company is famous for its excellent customer service, but I found this story exceptionally interesting. One customer's feet were two different sizes: a 9 and a 9.5. The salesman at the store split two pairs of shoes for one order. Now, the book is more than short stories about the little somethings extra companies do. It really is a study into marketing behavior and how develop the customer experience. There are some fantastic, basic rules that will make sense more than your college textbook. Do you offer a little something extra to your customers? It's not always easy, especially if you're a small business, like me. I have two. The first is the Bigelow Tea example. This lagniappe was born out of economy, not marketing strategy. 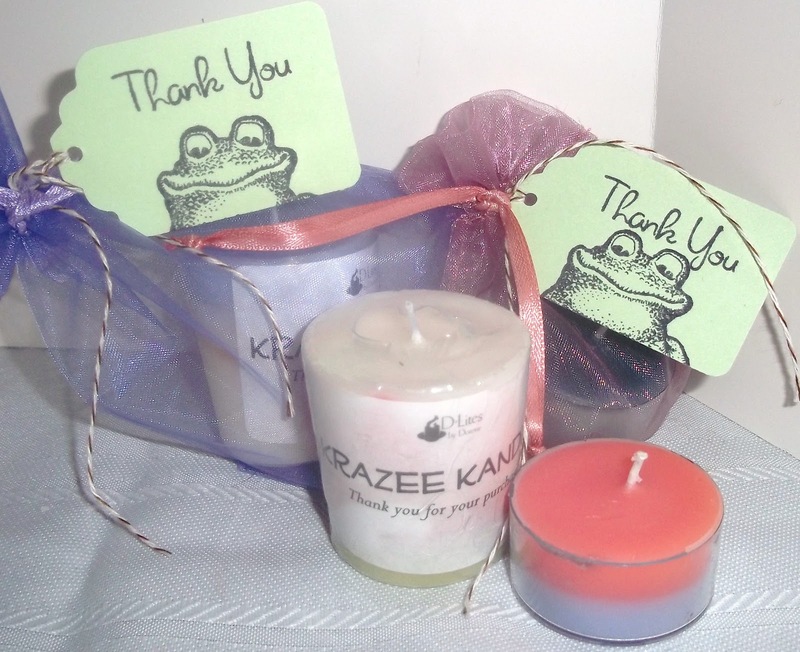 I send a "Krazee Kandel" with every order. Some are tea lights, some are votives, all made from leftover amounts of wax I cannot use in the future. It's supply I have, can't do anything with, yet is a relevant gift as a means to say "thank you." Always packaged neatly with my signature froggie thank you tags. My second was recently introduced. Knowing happy customers are the best word of mouth, I decided to start a referral program. To my repeat customers, I include a referral card for them to give a friend or colleague to recommend my product. If that friend makes a purchase, she/he receive 15% off their entire order, and my customer receives the same discount from her next order. The discounts are truly minimal given the increased sales brought my way. So today I ask you, what is your marketing lagniappe? Post it here. Maybe a reader will be inspired to follow your example, maybe a new to you customer will see if and bring you new business! P.S. All those who post their examples, will be entered into a drawing. If I draw your name, I'll feature your shop in an upcoming post! Most recently I went to jiffylube for an oil change and they found a leak in my tank. Since the oil change would be worthless, he filled my oil free of charge so that I could get it fixed later. Stan Phelps retweeted my blog post! "RT @DLitesbyDorene: New post: WYPG? ow.ly/arbNt #bestofetsy #promofrenzy #handmadebot @Etsy >> Great PG, love the Krazee Kandle"
Wonderful idea. I need to cast about and find a little something to send along with my orders. I used to do that but ran out of 'little somethings'. Great post! It really makes you stop and think, what can I do, even the slightest compliment, coupon, referral, or sample would do for our customers! Dorene, I love your candles and the something extra. I'm providing an online coupon code in an email. Congrats and I love your extra! I try to give something extra to each customer for business (unless it is a small photo order since I have to ship those flat but it is packaged nice) and at "real life" work I really go out above and beyond running around and really seeing customers through. I have been toying with this idea for a while now... as I tend to spend on Etsy while browsing lol - I have received some wonderful little extras. My shop sells photos, what would be appropriate? If you ask me, it is a tough one! Will be most grateful for suggestions! April Fragrance of the Month is.....?